East Aurora, NY, April 1, 2019 - Astronics Corporation (Nasdaq: ATRO), a leading provider of advanced technologies for global aerospace, defense, and other mission-critical industries, announced an expanded line of CorePower® power conversion products for use on commercial aircraft, business jets, and rotorcraft applications. 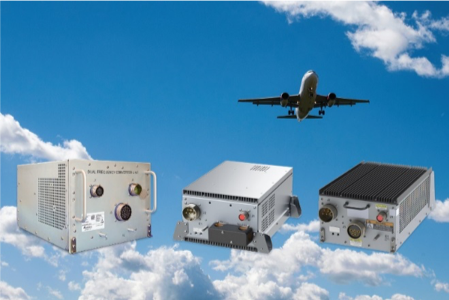 These new power converters are available off-the-shelf and certified to provide an easy path for modernizing aircraft power systems. Astronics’ new power conversion line leverages new technology for significant weight and size reduction on commercial aircraft, business jets, and rotorcraft. Offered by Astronics AES, a wholly owned subsidiary of Astronics Corporation, the new power products serve emerging needs in the market. Although there have been significant improvements in engines, avionics, and structural materials to improve aircraft performance, in many cases aircraft electrical power conversion is outdated. Regulated Power Converter – Astronics recently qualified and is delivering 150amp and 250amp Regulated Power Conversion Units (RPCU). This new product family performs the function of a traditional transformer rectifier unit (TRU), but has the additional advantages of a regulated output voltage, increased power conversion efficiency, and a 30% weight reduction, compared to a traditional TRU. Dual Frequency Converter – Recently entering service, the Dual Frequency Converter Unit (DFCU) provides the majority of a complete business jet cabin power system in a single box. The DFCU converts aircraft AC power to well regulated, constant frequency utility power for the aircraft cabin equipment. This approach greatly simplifies aircraft installation by including power distribution, power conversion, and wire protection functions integrated into a single unit. Frequency Converter – To support the increased usage of variable frequency AC power in modern aircraft, the Astronics Frequency Converter Unit (FCU) provides frequency conversion for the electrical loads that require fixed frequency power. The FCU tightly regulates output power to protect sensitive load electronics from unregulated frequency, variations in voltage and power surges. Static Inverter – The Astronics 1.2kVA Static Inverter provides 115VAC, 60Hz or 400Hz power to AC loads from a 28VDC power input. Output frequency is selected by pin strapping, so only one part number is purchased for multiple uses. Typical applications range from powering 60Hz outlets to providing battery backup power for critical 400Hz electronics. Weighing in at just 5 pounds the Static Inverter is a welcome improvement on this traditionally heavy technology. 270VDC to 28VDC Bidirectional Converter – 270VDC power is a well-recognized trend in the industry. To support more electric aircraft platforms and this higher power architecture, Astronics is offering a bidirectional DC/DC converter unit (DCCU) that converts 270 VDC to/from 28 VDC power. With a continuous power capability of 7kW and a weight of just 10.5 pounds, the DCCU packs a lot of capability into a small, lightweight package. All of these new power converters are either certified or expected to be certified in the next year, and are shipping to customers on a range of aircraft platforms. Astronics will display the Regulated Power Converter and Dual Frequency Converter in Stand 3B30 at the upcoming Aircraft Interiors Expo, April 2-4, in Hamburg Germany. Astronics Corporation (Nasdaq: ATRO) serves the world’s aerospace, defense, and other mission-critical industries with proven, innovative technology solutions. Astronics works side-by-side with customers, integrating its array of power, connectivity, lighting, structures, interiors, and test technologies to solve complex challenges. For 50 years, Astronics has delivered creative, customer-focused solutions with exceptional responsiveness. Today, global airframe manufacturers, airlines, military branches, completion centers and Fortune 500 companies rely on the collaborative spirit and innovation of Astronics.